Baby names, Irish-American movies and green pancakes: some of the things we’re apparently brilliant at. ST PATRICK’S DAY puts the spotlight on us every year and it seems the whole world is Irish for a day. And why wouldn’t they? 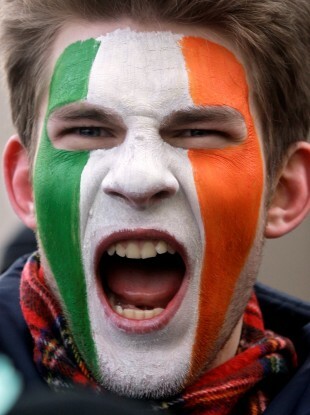 According to these ‘Top 10′ lists of great Irish things, sure we’re only brilliant. 1. Peter O’ Toole – He first hit stardom in 1962 in Lawrence of Arabia. He went on to star in such films as Zulu Dawn, Troy and was a regular in the hit Irish TV series The Tudors. 2. Richard Harris – The late great Richard Harris comes in at second place. One of the last roles he played before his death was Dumbledore in Harry Potter. 3. Gabriel Byrne – started his career in soaps but went on to greatness, most recently in US TV series, In Treatment. 4. Brendan Gleeson – A late starter but no less a star for it, most recently in Irish movie The Guard. 5. Cillian Murphy – One of the younger actors on the list. Caught the international eye in movies such as Red Eye and Inception. 1. The Departed – Thriller about an Irish mobsters and organised crime starring Jack Nicholson, Mark Wahlberg adn Leonardo Di Caprio. 2. Yankee Doodle Dandy – Story about George M Cohan, first generation Irish American who is played by James Cagney. 3. Gangs of New York – another Scorsese film to top the list of Irish American movies. 5. In America- Directed by Jim Sheridan this film traces the journey of an Irish family who move to America. 7.The Sullivans – Story about Irish American brothers who join the navy in World War II. 8. State of Grace – Movie about Terry Noonan (Sean Penn) who gets embroiled in the Irish mob after a ten year absence from home. 9. Ladder 49 – Film centred around Irish American fire-fighting family. 10. Far and Away – Tom Cruise and Nicole Kidman star in Irish immigration movie sporting some dreadful Irish accents. Top Ten Recipes for St Patrick’s Day- A list of Irish Mammy dinners have been summed up by Irish Central listing corned beef and shepherd’s pie among the staples of the Irish diet. It’s not just acting, movies, beer and food we are loved for – here is round up of some other things the world thinks we do quite well. The Daily Meal thinks we have some great Irish pubs in the States while Irish Central thinks no one recovers from a hang over like an Irish person. They have also compiled a list of the top ten Irish mobsters and outlaws. The world thinks the Irish are apparently also great at sport, music and cute baby names. U2 are always synonymous with Ireland but BBC America thinks we have some other great bands too and has compiled a list of Ireland’s other top bands (that are not U2). Golf is another one of our trump cards – The New York Times has even asked the question – what is it that makes us so good at the sport. With Rory Mcilroy (below) fast becoming the nations biggest sports star, Irish sporting success is only set to continue. Email “Ireland's best bits - stuff the world thinks we're great at”. Feedback on “Ireland's best bits - stuff the world thinks we're great at”.